The general information provided on the Website is for informational purposes only and is not professional medical advice, diagnosis, treatment, or care, nor is it intended to be a substitute therefore. Always seek the advice of your physician or other qualified health provider properly licensed to practise medicine or general healthcare in your jurisdiction concerning any questions you may have regarding any information obtained from this Website and any medical condition you believe may be relevant to you or to someone else. Never disregard professional medical advice, or delay in seeking it because of something you have read on this Website. Always consult with your physician or other qualified healthcare provider before embarking on a new treatment, diet, or fitness program. Information obtained on the Website is not exhaustive and does not cover all diseases, ailments, physical conditions, or their treatment. The Website and the Content are provided “AS IS” and “ASVAILABLE”. While Preventous endeavours to provide information that is correct, accurate, current, and timely, Preventous makes no representations, warranties, or covenants, express or implied, regarding the Website and the Content including, without limitation, no representation, warranty, or covenant that (i) the Content contained in or made available through the Website or any item(s) made available on or through the Website will be of merchantable quality and/or fit for a particular purpose; (ii) the Website or Content will be accurate, complete, current, reliable, timely, or suitable for any particular purpose; (iii) that the operation of the Website will be uninterrupted or error-free; (iv) that defects or errors in the Website or the Content, be it human or computer errors, will be corrected; (v) that the Website will be free from viruses or harmful components; and (vi) that communications to or from the Website will be secure and/or not intercepted. In no event shall Preventous, its physicians, officers, directors, employees, agents, licensors, and their respective successors and assigns be liable for damages of any kind, including, without limitation, any direct, special, indirect, punitive, incidental, or consequential damages including, without limitation, any loss or damages in the nature of, or relating to, lost business, medical injury, personal injury, wrongful death, improper diagnosis, inaccurate information, improper treatment, or any other loss incurred in connection with your use, misuse, or reliance upon the Website or the Content, or your inability to use the Website, regardless of the cause and whether arising in contract (including fundamental breach), tort (including negligence), or otherwise. The foregoing limitation shall apply even if Preventous knew of or ought to have known of the possibility of such damages. Preventous also expressly disclaims any and all liability for the acts, omissions, and conduct of any third-party user of the Website, or any advertiser or sponsor of the Website (“third-party”). Under no circumstances shall Preventous, its physicians, officers, directors, employees, agents, licensors, and their respective successors and assigns, be liable for any injury, loss, damage (including direct, special, indirect, punitive, incidental, or consequential damages), or expense arising in any manner whatsoever from (i) the acts, omissions, or conduct of any third-party; and (ii) any access, use, reliance upon, or inability to use any materials, content, goods, or services located at, or made available at, any Website linked to or from the Website, regardless of the cause and whether arising in contract (including fundamental breach), tort (including negligence), or otherwise. The foregoing limitation shall apply even if the Owner knew of or ought to have known of the possibility of such damages. You agree to indemnify, defend, and hold harmless Preventous and its physicians, officers, directors, employees, agents, licensors, and their respective successors and assigns, from and against any and all claims, demands, liabilities, costs, or expenses whatsoever, including, without limitation, legal fees and disbursements, resulting directly or indirectly from (i) your breach of any of the terms and conditions of this Agreement; (ii) your access to, use, misuse, reliance upon, or inability to access or use the Website, the Content, or any Website to which the Website is or may be linked to from time to time or; (iii) your use of, reliance on, publication, communication, distribution, uploading, or downloading of anything (including the Content) on or from the Website. The Content is protected by copyright law and is owned Preventous its licensors, or the party accredited as the provider of the Content. Except as granted in the limited licence herein, any use of the Content, including modification, transmission, presentation, distribution, republication, or other exploitation of the Website or of its Content, whether in whole or in part, is prohibited without the express prior written consent of Preventous. Subject to the terms and conditions of this Agreement, you are hereby granted a limited, non-transferable, and non­exclusive licence to access, view, and use the Website and the Content for your personal, non-commercial use. You are granted the right to download, store, and/or print single copies of items comprising the Content for your personal, non­commercial use, provided that you maintain all copyright and other notices contained in such Content. You may not copy and/or repost items comprising the Content online. You must also abide by any additional requirements governing the use of any specific Content that may be set out in the Website. In the event of a conflict between the terms of a licence governing specific Content and this Agreement, the terms of the specific licence shall govern. 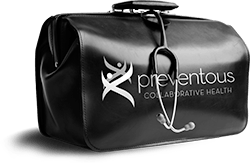 Preventous and Preventous Collaborative Health is/are trademarks of the Owner. Other names, words, titles, phrases, logos, designs, graphics, icons, and trademarks displayed on the Website may constitute registered or unregistered trademarks of Preventous or third parties. While certain trademarks of third parties may be used by the Owner under licence, the display of third-party trademarks on the Website should not be taken to imply any relationship or licence between Preventous and the owner of the trademark or to imply that the Owner endorses the wares, services, or business of the owner of the said trademark. The Website contains links to third-party Websites. These links are provided solely as a convenience to you and not as an endorsement by Preventous of any third-party Website or the content thereof. Unless expressly stated, Preventous does not operate any third-party Website linked to the Website and is not responsible for the content of any third-party Website, nor does it make any representation, warranty, or covenant of any kind regarding any third-party Website including, without limitation, (i) any representation, warranty, or covenant regarding the legality, accuracy, reliability, completeness, timeliness, or suitability of any content on such third-party Websites; (ii) any representation, warranty, or covenant regarding the merchantability and/or fitness for a particular purpose of any third-party Websites or material, content, software, goods, or services located at or made available through such third-party Websites; or (iii) any representation, warranty, or covenant that the operation of such third-party Websites will be uninterrupted or error free, that defects or errors in such third-party Websites will be corrected, or that such third-party Websites will be free from viruses or other harmful components. While Preventous encourages links to the Website , it does not wish to be linked to or from any third-party Website which contains, posts, or transmits any unlawful or indecent information of any kind, including, without limitation (i) any content constituting or encouraging conduct that would constitute a criminal offense, give rise to civil liability, or otherwise violate any local, state, provincial, territorial, national, international law or regulation which may be damaging or detrimental to the activities, operations, credibility, or integrity of Preventous; or (ii) any Website which contains, posts, or transmits any material or information of any kind which violates or infringes upon the rights of others, including material which is an invasion of privacy or publicity rights, or which is protected by copyright, trademark, or other proprietary rights. Preventous reserves the right to prohibit or refuse to accept any link to the Website, including, without limitation, any link which contains or makes available any content or information of the foregoing nature, at any time. You agree to remove any link you may have to the Website upon the request of Preventous. All software embedded in or located on or at the Website, including, without limitation, all computer code of all types, including all files and/or images contained in or generated by such software (“Software”) is protected by copyright and may be protected by other rights. All such Software is owned by Preventous, its licensors, or the party accredited with ownership of such Software. You are hereby granted the right to access and use the Software embedded and integrated into the Website, subject to (i) the terms and conditions of this Agreement; and (ii) any additional conditions which may be imposed on your access and use of such Software. If the Website provides Software for download, unless otherwise provided, you are hereby granted, subject to the terms of this Agreement and to any other specific terms and conditions that may apply to your downloading and use of such Software, a personal, non-transferable, non-exclusive licence to (i) install and run one copy of the Software in object code format on a non-networked computer for your personal, non-commercial use; and (i) to reproduce the Software only as reasonably required to install, run, and make reasonable backup copies as allowed by law. Any information sent or received over the Internet is generally not secure. Preventous cannot guarantee the security or confidentiality of any communication to or from the Website. Preventous reserves the right any time, and from time to time, to modify or discontinue, temporarily or permanently, the Website (or any part thereof) with or without notice to you. Preventous shall have no liability to you or any third party for any modifications, suspension, or discontinuance of the Website or any part thereof. You agree that all matters relating to your access or use of the Website and its Content shall be governed by the laws of Alberta and the laws of Canada applicable therein, without regard to conflict of laws principles. You agree and hereby submit to the exclusive and preferential jurisdiction of the courts of the province of Alberta with respect to all matters relating to your access and use of the Website and the Content as well as any dispute that may arise therefrom and that the applicable law shall be the law of the province of Alberta and of Canada. Any consent by Preventous to, or waiver of, a breach of this Agreement which you have committed, whether express or implied, shall not constitute a consent to, or waiver of any other, different or subsequent breach. Question or comments regarding the Website should be directed by email to . Preventous may, in its sole discretion, cancel or terminate your right to use the Website, or any part of the Website, at any time without notice. In the event of termination, you are no longer authorized to access the Website, or the part of the Website affected by such cancellation or termination. The restrictions imposed on you with respect to material downloaded from the Website and the disclaimers and limitations of liabilities set forth in this Agreement, shall survive termination of this Agreement. Preventous shall not be liable to any party for such termination. This is the entire Agreement between you and Preventous relating to your access and use of the Website.